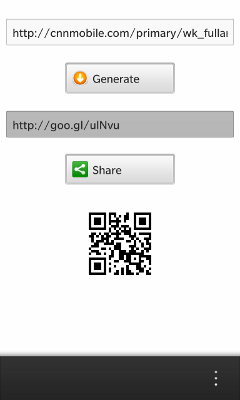 The Url Shortener lets you create a short url to send to your friends, employees, ... etc. The app uses goo.gl which "allows you to track, in real-time, the clicks and referrers on any shortened URL - a perfect tool to help you understand what appeals to your audience and to help you optimize your social, email, and other click-through campaigns." Type or paste the long url and click "Generate". The created short url will be copied to the clipboard, so you can paste it into other apps. 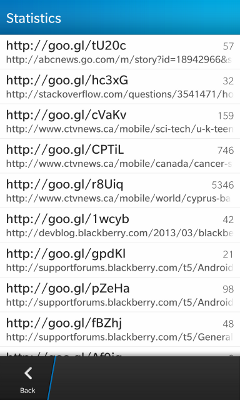 Share the short url via your favorite apps like facebook, twitter, email, BBM, SMS, ... etc. It also generate QR code you can scan from other phones or devices. 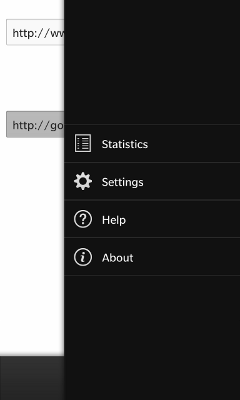 From the browser select "Share" from the menu and select our app from the Share list and it will get the url directly, no typing required. You can also select a url in any app and tap & hold the selection then select "Share" from the context menu then select our app. 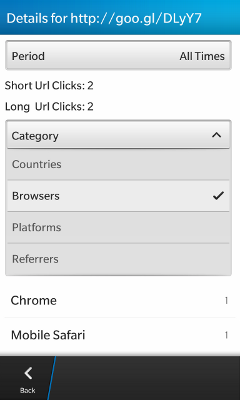 View statistics for different period of times and see the clicks per country, browser, platform, referres. A Google account is required to track the generated short urls. 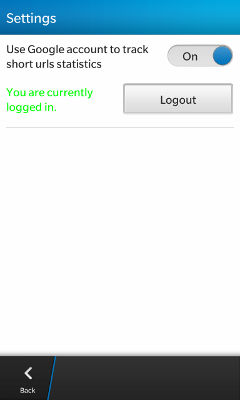 Another cloud manager released to BlackBerry World.